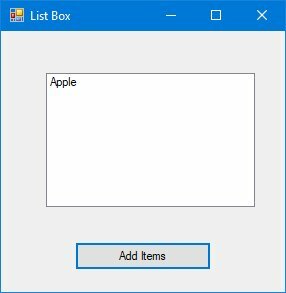 In Visual Basic.Net, items can also be added at runtime using the Add( ) method. We can apply this method in Visual Basic 2017, Visual Basic 2015, Visual Basic 2013, Visual Basic 2012, Visual Basic 2010 as well as Visual Basic 2008. Besides that, we can also allow the user to add items via a popup input box. Visual Basic 2008 Made Easy is written by Dr. Liew, the webmaster of our popular online Visual Basic Tutorial, vbtutor.net. This book is a comprehensive guide to mastering Visual Basic 2008, from beginner to intermediate programmers. This book has been written to complement our free online Visual Basic 2008 tutorial with much more content. It is also an excellent reference text for high school or college-level computer science courses. 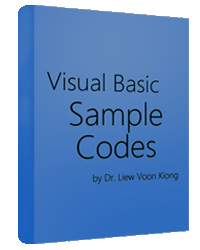 We have released another Visual Basic Made Easy Series book, Visual Basic 2015 Made Easy. 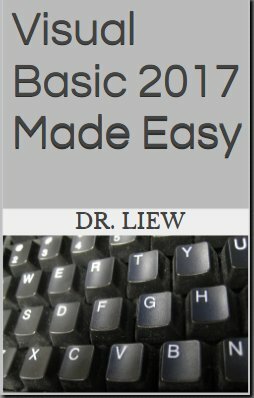 Visual Basic 2015 Made Easy is written by Dr. Liew, the webmaster of our popular online Visual Basic Tutorial, vbtutor.net. This book is a complete guide to mastering Visual Basic 20157, from beginner to intermediate programmers. This book has been written to complement our free online Visual Basic 2017 tutorial with much more content. It is also an excellent reference text for high school or college-level computer science courses. Our New Visual Basic 2013 Made Easy Paperback is released today! Visual Basic 2013 Made Easy is now available in the paperback version where you can hold and read! Our tutor Dr.Liew has revamped the digital book by redesigning the formats to make it more reader-friendly. Besides that, he has added a few more topics like drawing the quadratic curve, drawing the sine curve, deploying your VB2013 applications and more. This book is a complete guide to mastering Visual Basic 2013, from beginner to intermediate programmers. This book has been written to complement our free online Visual Basic 2013 tutorial . It is also an excellent reference text for high school or college-level computer science courses.